Category Archives: What have they done? Rothschild, What have they done? 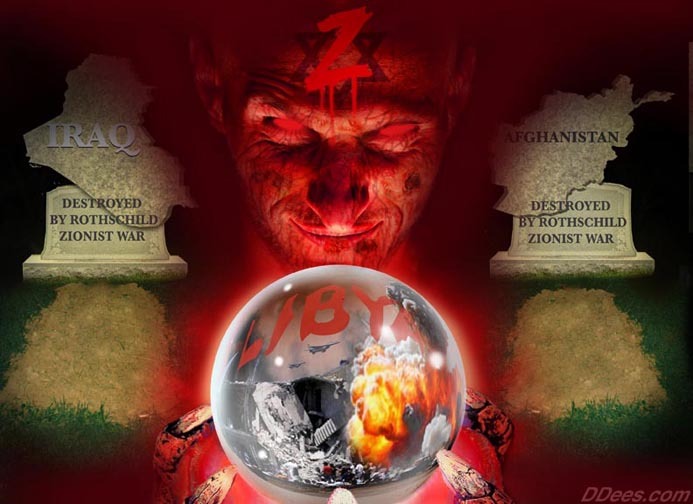 axis-of-evil, Balkanization, Bankers, Real history, What have they done? Bankers have perfected a profitable pattern of taking over countries and their wealth, using a team of talented public relations people, compromised local government officials, the UN, NATO and USA military. The “Axis of Evil” was a list of countries that did not have a central Rothschild bank and wished to handle their oil wealth in currencies other than dollars. Bankers are now working to take more countries down as quickly as possible, especially in the Middle East and Eastern Europe. Apparently Russia is in their crosshairs as well, as they are vilifying Russia on a daily basis. Debt, death, destruction, bribery, threats, blackmail, poverty, propaganda, pitting people against another, outright lying, rewriting history, torture, arranging suicides among their own employees, murder, war. Bankers are well organized and have figured out how to take down the world, one nation – or maybe two or three or four – at a time. This is gangster behavior on a big scale. Here we have the sad story of what used to be known as Yugoslavia. The Weight of Chains | Težina lanaca (2010) – YouTube. Boris Malagurski’s award-winning Canadian film The Weight of Chains, dealing with the breakup of Yugoslavia from a different angle… If you thought you knew why Yugoslavia broke up, get ready for 2 hours of shocking facts that will shed a different light on Western intervention in the Balkans… Malagurski will expose the root causes of the Yugoslav wars and explain that the goal was for the West to create economic and geopolitical colonies in that part of the world. Israel belongs to the Rothschilds – YouTube. The Rothschilds own 80% of Israel, according to Simon Schama. They built the Israeli Supreme Court. They own Reuters and the Associated Press (AP), the two biggest media agencies in the world. They have a controlling share in the Royal Dutch oil company, the Bank of England and the LBMA (London Bullion Market Association). They foment wars, install presidents, dethrone kings and bankrupt nations, such is their power. There is a big problem with this. Palestine was never Britain’s to give away… Zionist Israel controls the governments of the US, Britain, Canada, France and more – and the Rothschilds control Israel. Mind control, What have they done? Murder by Plane: Senator Wellstone – YouTube. If you vote against the war in Iraq, the Bush administration will do whatever is necessary to get you. There will be severe ramifications for you and the state of Minnesota. Jewish Man Brags About Blowing Up King David Hotel (documentary) – YouTube. When shootings don’t make sense, it is because killing is not a natural human behavior. Shooters are not born killers and neither are warriors – they have been intentionally made. Sometimes circumstances are so hurtful that people lash out in frustration because they feel powerless to address the abuse. In other cases they have been made at the hands of skilled experts. The “Manchurian Candidate” has taken many forms over the years. MK Ultra’s real purpose was to take traditional Satanism and turn it into a scientific method. So it’s really the science of Satanic Ritual Abuse. This is trauma-based mind control. A person is traumatized with torture, drugs and sensory deprivation to the point of becoming disassociated. The victim disconnects from his or her natural personality and develops a new one. It’s as if the person has become possessed by a demon. And one might argue that demon possession is what’s really going on. This new personality is controlled by the programmer. So persons can be brainwashed into doing things which go against their natural values. When the child is 2 years old, place them in a metal cage with electrodes attached. Shock the child severely. Take the child out, and place a kitten in its hands. Tell the child to wring the kitten’s neck. The child will cry and refuse. Put the child into the cage, and shock them until they are dazed and cannot scream any more. Take the child out, and tell them again to wring the kitten’s neck. This time the child will shake all over, cry, but do it, afraid of the torture. The child will then go into the corner and vomit afterwards, while the adult praises them for “doing such a good job”. This is the first step. The animals get bigger over time, as the child gets older. They will be forced to kill an infant at some point, either a set up or VR, or in reality. They will be taught by age 9 to put together a gun, to aim, and fire on target and on command. They will then practice on realistic mannikins. They will then practice on animals. They will then practice on “expendables” or in VR. They will be highly praised if they do well, and tortured if they don’t comply. The older the child or teen, the more advanced the training. By age 15, most children will also be forced to do hand to hand combat in front of spectators high people who come to watch the “games” much as the ancient gladiators performed. These matches are rarely done to the death, usually until one child goes down. They use every type of weapon imaginable, and learn to fight for their lives. If a child loses a fight, they are heavily punished by their trainer, who loses “face”. If they win, they are again praised for being “strong’ and adept with weapons. By the time they are 21, they are well trained combat/killing machines with command codes to kill and they have been tested over and over to prove that they WILL obey on command. This is how children in the German Illuminati are brought up, I went through it myself. Read more at Part 16 – Lone Gunmen | Svali Speaks. The James Holmes Conspiracy is for those who do not believe the story being told by the government and media. James Eagan Holmes is the suspected perpetrator of a mass shooting that occurred on July 20, 2012, at a movie theater in Aurora, Colorado. He had no known criminal record prior to the shooting. Several witness testimonies, news reports, theories and ideas behind the motives of the crime. LIBOR scandal, MK Ultra, Project Gunrunner, and several other important elements. Several new pieces of evidence and testimonies all in one video. For now, they’re based on media accounts of the killing spree on May 23, in Isla Vista, California—and of course, these media accounts of mass murders should never be accepted, on their face, as ironclad facts. Rodger is reported to be the son of Peter Rodger, a unit director of the film, Hunger Games. According to press accounts, the father specifically directed a short film within that film—a propaganda piece extoling the “new society” in which ritual sacrifice of children in the Games is a way of never forgetting the treason of rebellion/war in the “old society,” the rebellion which must never happen again. As a parallel to the film, the killing of children in Isla Vista on May 23 will forward two agendas which are claimed to be crucial to maintaining the cohesion of the new emerging society: wall-to-wall gun control and massive/invasive/toxic psychiatric care across every stratum of the population. Such was also the agenda in the wake of Sandy Hook—where Suzanne Collins, the author of Hunger Games, resides. Like Elliot Rodger, Attias is the son of a Hollywood director, Dan Attias (Ally McBeal, The Sopranos). Truth Rising… The Blood Sacrifice of Trayvon Martin – YouTube. Read this and other excellent articles at As Bank Deaths Continue to Shock, Documents Reveal JPMorgan Has Been Patenting Death Derivatives. Be sure to read links at the bottom of each article… they lead to more articles… great research, great articles! Thanks to WallStreetOnParade.com!! !